It’s been a while. I am in Paris. 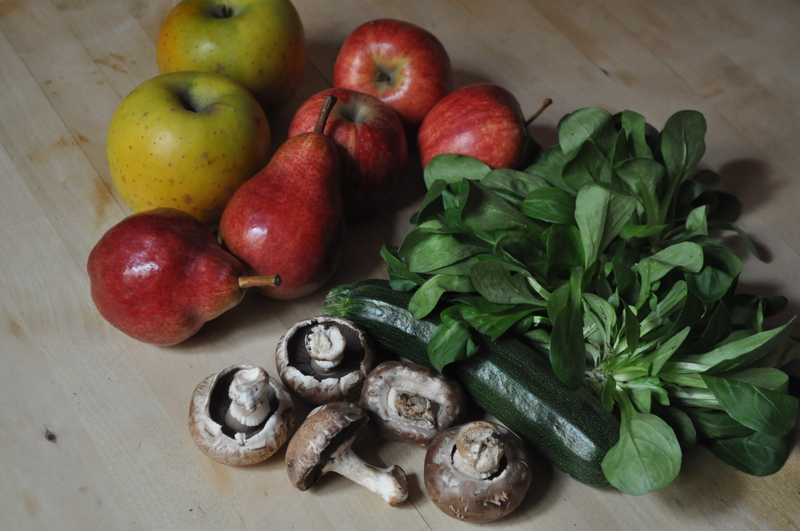 These are the some of the fresh, amazingly beautiful things I picked up from the marché biologique (organic market!) that takes place every Saturday morning a five-or-so minute walk from my apartment. After the market, I stopped at my neighborhood boulangerie for a pain aux céréales (essentially, a wheaty/seedy baguette) for my after-dinner cheese course that I can no longer live without. Essentially, I am living my dream life right now. But in other news: hi! I haven’t posted once in 2013. Hello, friends, hello. I am alive! Quick updates: I am studying abroad here in France this semester and I could not be in a more ideal foodie-paradise. I kid you not when I say I practically cry tears of joy every time my waiter brings me my dish at a restaurant, I take a bit of bread/cheese/yogurt/pastry, etc. The French really do food and they do it well. I have been hardly cooking at all (no, the occasional omelette, tartine, or muesli bowl do not satisfy my NEED to be cooking) and it has been really, really hard for me. I mean really hard. I live with a host family of six sooo, needless to say, I very rarely get access to the kitchen. Even when I do, it’s generally a “quick! fry an egg, slice some avocado and get out ASAP!” situation as to stay as out of the way as possible. The French are very particular about their kitchens; they do not really love other people messing around in them so much. They also take a lot of pride in the food they prepare. If a French person makes you food, I would recommend you take seconds. Oh, and you better compliment it. All that being said, I’m pretty sure I’m meant to be French. My constant food-obsessing and preference for fresh, well-made things that has been deemed as “food snobbery” on many occasions back home is pretty much the standard here. So, essentially, I’ve found my home. I may never leave. First of all, prepare your quinoa and set aside. Fry up your eggs and do the same. Heat up your olive oil in a pan on medium, mince your garlic, and add it to the pan, sautéing for about a minute or so. Add your zucchini and mushrooms to the pan and continue to cook for about 2-4 minutes until they’re soft, constantly stirring. Salt and pepper your veggies to taste. 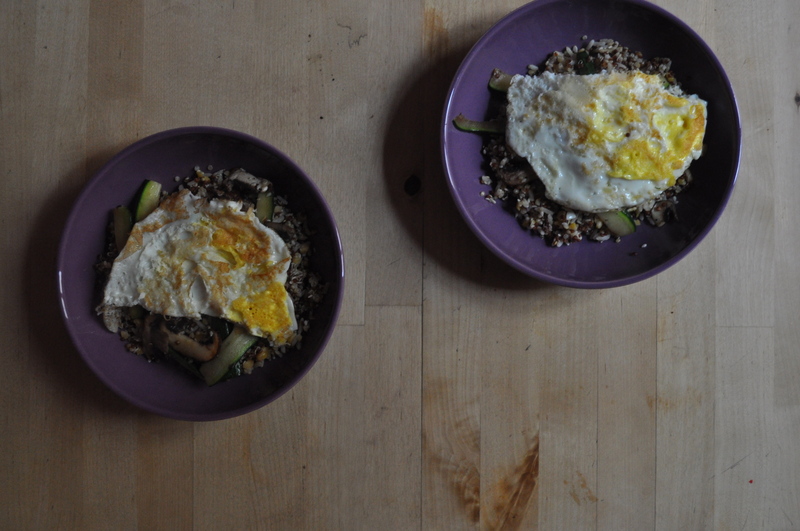 Put your quinoa in 2 bowls, add your veggies, put your eggs on top, et voilà ! If you’re feeling really adventurous, slice up an avocado and put it right on top. I did this as an afterthought post-photo-taking, and I’m really glad I did. Although that might just be because I have a borderline creepy obsession with avocados. But you already know that. Now, if I were to do the more committed version of this (and by that I mean what I wish I had done/what I would have done if I wasn’t feeling quite so lazy), I would’ve poached my eggs and added thinly-sliced carrots to the veggie situation. But, alas. My limited time/resources/patience strike again. Hopefully I can post again soon. I really have missed my blog. No promises, though! I’m too busy living la vie, you know? Categories: Breakfast, Dinner, Snack | Tags: courgette, egg, France, lunch, mushroom, Paris, quinoa, zucchini | Permalink. This was an experiment. It turned out rather beautifully, if I do say so myself! My one complaint: these were not super solid. In fact, they were rather crumbly, which was unintentional, but unavoidable. Allow me to explain. I had been waiting for a few days until I had time to make something delicious with my sweet potatoes and was shocked and upset to discover upon opening their little bag that I’d been stashing them in that two of them were moldy! I don’t understand why, seeing as they were in a nice, dry spot in my cupboard but apparently that wasn’t good enough. Hmph. (Can you tell I’m bitter?) Anyways, I salvaged two scrawny sweet potato babies, but the two heftier ones were not so lucky, hence my slightly crumbly quinoa cakes. I’m going to write the recipe as I intended to do it and hopefully it will work out better for those of you who might try it. When I make these again (which I certainly will, they were yummy! 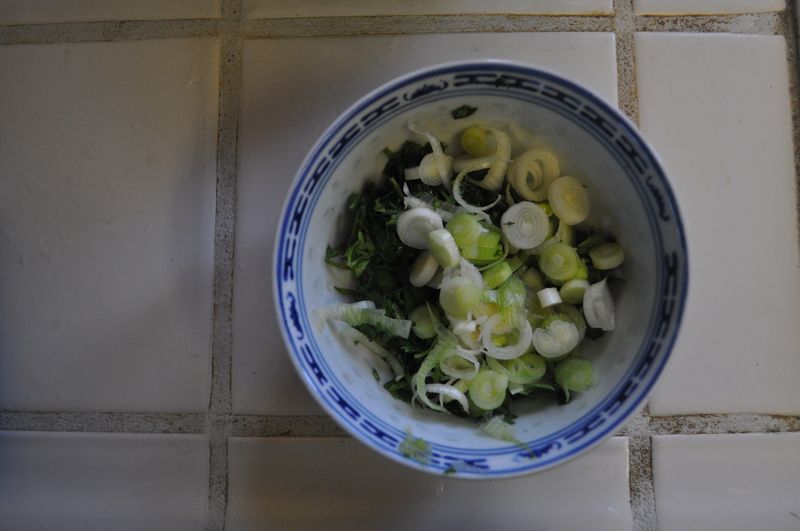 ), I’ll update this post as needed if I alter the recipe. Sound good? Good! First, cook your quinoa and set it aside to let it cool. Saute your spinach in a little bit of olive oil on medium heat until it’s wilted–this should take about 5 minutes. Add your minced garlic and cook for another minute or so. 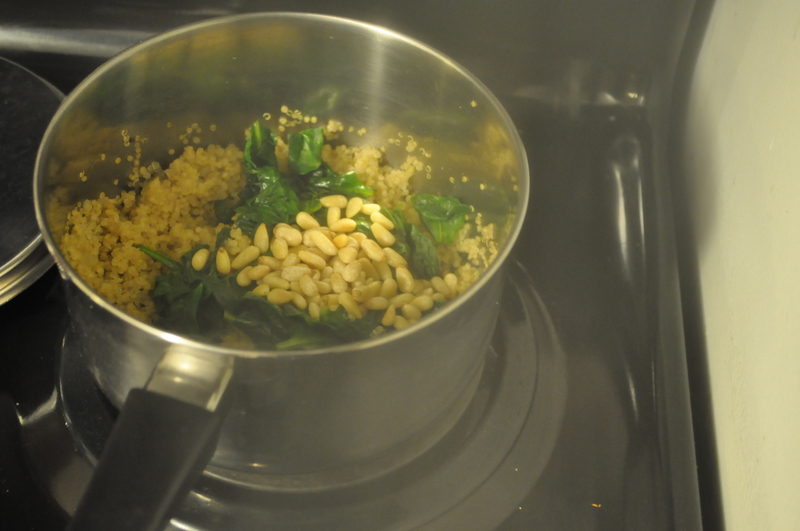 Throw your garlic and spinach into your quinoa pot and get ready to toast your pine nuts. I wiped out my pan with a paper towel and just used that to dry toast them on medium-low heat until they were lightly browned. Throw those in with the rest of your cooling ingredients. Next, peel and dice your sweet potatoes and place them in a pot of water. 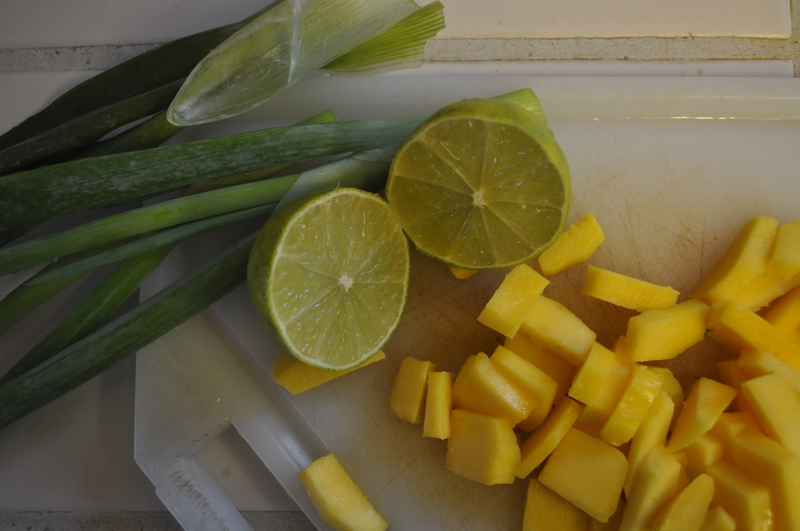 Bring the water to a boil and then reduce to a simmer, cooking them for about 10 minutes until they are tender. Drain the water, place them in a separate bowl and mash them up with a fork. Add this to your quinoa pot also. Make sure everything is cool before you move on, you don’t want to cook your egg! Add your parmesan, almond meal (or bread crumbs), egg, and salt and pepper and mix well. 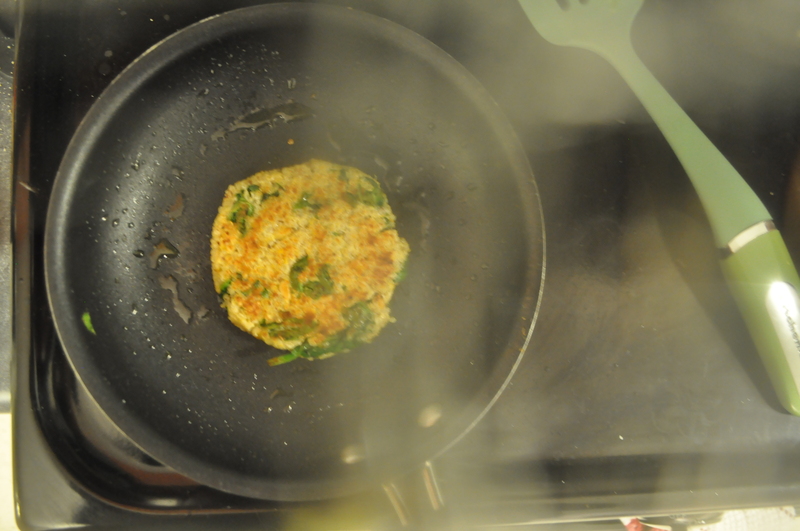 Heat a tablespoon or two of olive oil on medium heat in a skillet and form patties with your hands (I made 4!). Cook each quinoa cake for a few minutes on each side (mine took 5ish minutes per side) and enjoy! Ugh I’M SORRY my pictures are horrible. I’m getting increasingly frustrated with my broken lens issue. Although apparently not frustrated enough to get it fixed. The time will come soon. Oh and on another, more relevant note, I have a confession: I ate my quinoa cake with a rather weird condiment. And by rather weird I mean very weird. Please don’t make fun of me…….I spread pumpkin butter on top……..I KNOW IT’S STRANGE I don’t even know what possessed me to reach for it when I was surveying my options in the fridge. But I must say…it was oddly delicious. I was super into it. I’d recommend it to you, but most people probably aren’t as weirdly pumpkin-obsessed as I am. Whatever, guys. It was yummy. 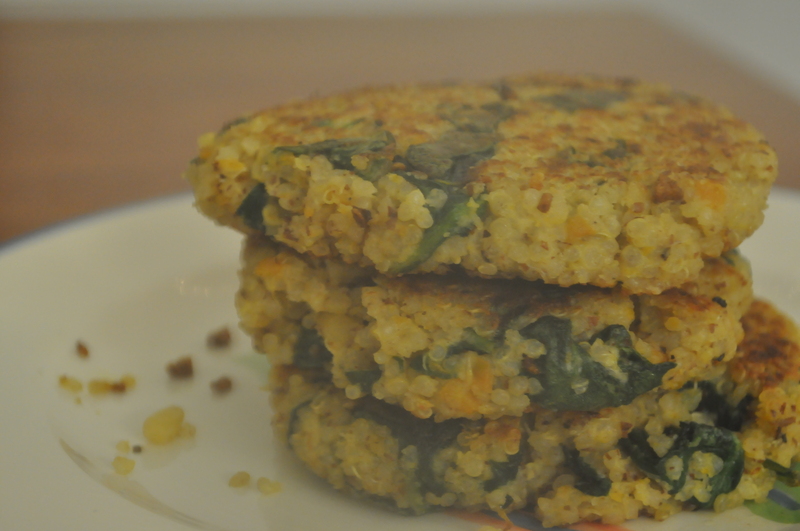 Categories: Dinner | Tags: cakes, dinner, patties, quinoa, spinach, sweet potato, vegetarian | Permalink. Today, I was downtown and stumbled upon this AMAZING ethnic food specialty grocery store kinda thing. I spent probably 15 minutes just looking at all the awesome things before I even picked anything up; when I finally did, I ended up buying crystallized ginger, pine nuts, and peach preserves. Don’t ask me why, it just seemed right. I had been craving pine nuts lately, so I really really needed these. They turned out to be a wonderful addition to my stuffed peppers, so thank goodness for this chance bulk pine nut discovery. Ohhhhhhh my goodness. I was so so happy with these. I got some red bell peppers from my co-op, as well as a bunch of funny-looking (but delicious!) mini eggplants and I figured combining them would be nice. Stuffed peppers are so fabulous. I enjoyed every bite of these. I didn’t want them to end. In fact, I ate all four halves; no shame. They were so delicious. ALRIGHT SO: I made this recipe for just me, so it was just enough filling to stuff inside 4 halves. If you want more, you could very easily double the recipe or whatnot. First and foremost, preheat your oven to 350. Next, toast your pine nuts in a dry skillet over medium-low heat until they’re nice and toasty. Make sure to keep moving them around so they’re evenly toasted! On a separate burner, cook your quinoa in the chicken stock. I did this so the quinoa was more flavorful, and I’m glad I did. If you don’t have chicken stock, you can always use water, it doesn’t make that much of a difference. Bring the chicken stock and quinoa to a boil, then turn the heat down to low and simmer, covered until most of the liquid is absorbed and the quinoa is fully cooked (about 10-15 minutes). Once your pine nuts are done, set them aside and use that skillet to cook your eggplant. Heat the olive oil in the skillet and throw in the garlic. After about a minute, add your eggplant and cook until soft–about 5 minutes or so. Season with salt and pepper. Once your eggplant and pine nuts are all ready, add them to the quinoa and mix together. Spoon the mixture evenly into the halved bell peppers and place on a baking sheet. Cover with tin foil and bake for 30 minutes, then take them out and add your cheese. Sprinkle your goat cheese on top (I pushed mine in a little bit so I could get as much as possible in there without it falling off the sides), drizzle lightly with olive oil and place back in the oven without the foil for another 15 minutes. Cheese should be lightly toasty-looking and peppers should be crinkly and soft. Remove and enjoy! I ate my peppers while sitting on the floor in my bedroom, watching Breaking Bad in the dark and I do not regret this one bit. It was a great end to a long weekend. Happy Columbus Day! GO STUFF SOME PEPPERS RIGHT NOW, I insist. 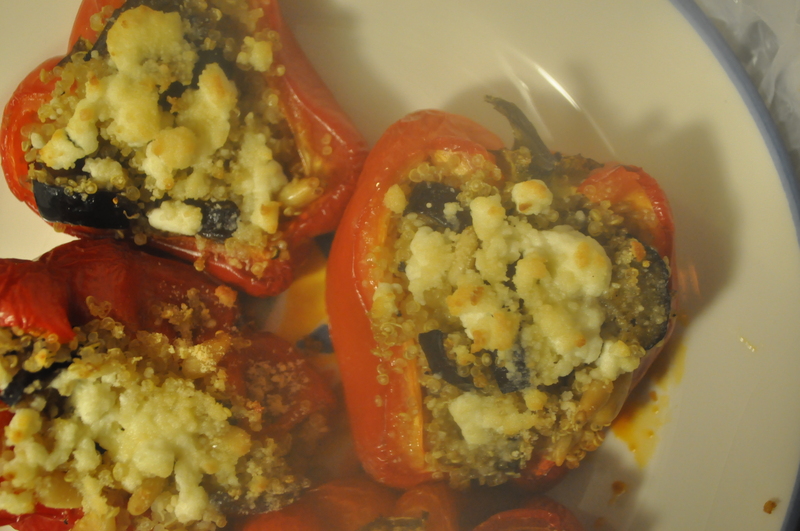 Categories: Dinner | Tags: bell peppers, dinner, eggplant, pine nuts, quinoa, stuffe, stuffed peppers | Permalink. Ughhhh I know I know. I’ve been awful at posting. I find that when I’m stressed/overwhelmed, I don’t post as much, which is sad. I should be doing the opposite. Anyways. Hi! This post is dedicated to quinoa. Okay I know, I’m like, 2+ years late on the quinoa bandwagon. It got so much hype a couple years ago because it’s sooooo healthy la di da (it’s actually not thaaat healthy…it’s still a grain. But as far as grains go it’s about as good as you can get, I guess) For a while I just avoided quinoa simply for that reason; it was trendy. Which annoyed me. There are so many dumb food trends (don’t get me started on tofu) and I thought this was just another one. I mean, it kind of is, just a slightly less dumb one. Alsooo there’s the fact that my lovely friend Marianne and I thought the word quinoa was hilarious, so it kind of became a joke and I just never bothered to try it. Despite all the silly trendyness and such, quinoa is actually not bad at all. Recently I’ve been making breakfast quinoa and today for a dinner side I made a quinoa salad (thanks for the recipe, Amanda!). The breakfast quinoa is like a just-as-delicious-but-slightly-healthier oatmeal. Although it’s not as quick and easy as my avocado toast, when I’m not feeling quite so lazy I love to make it in the morning. 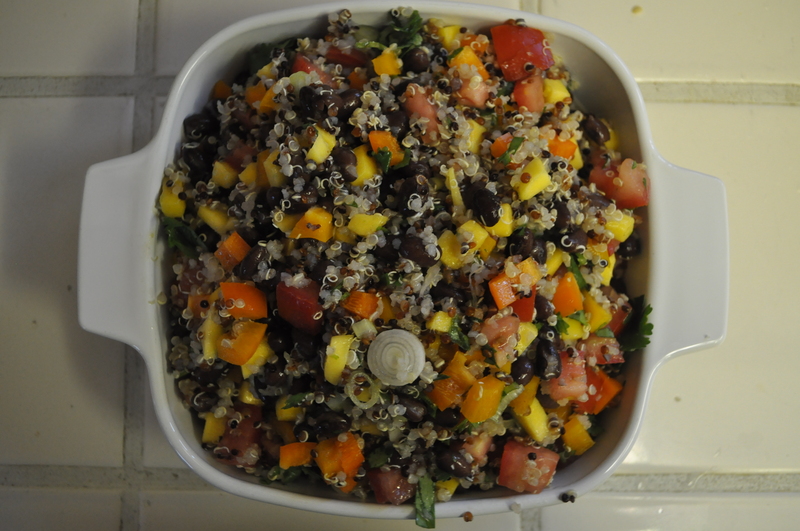 The quinoa salad is a yummy, summery side that would be a great barbecue addition. Try quinoa! Heh. Okay, maybe the name still is a little funny. Bring the quinoa and the milk to a boil in a saucepan then bring it down to a simmer for about 13 minutes until the grain is fully cooked and the milk has boiled down. Pour your cooked quinoa into a bowl and add your goodies! 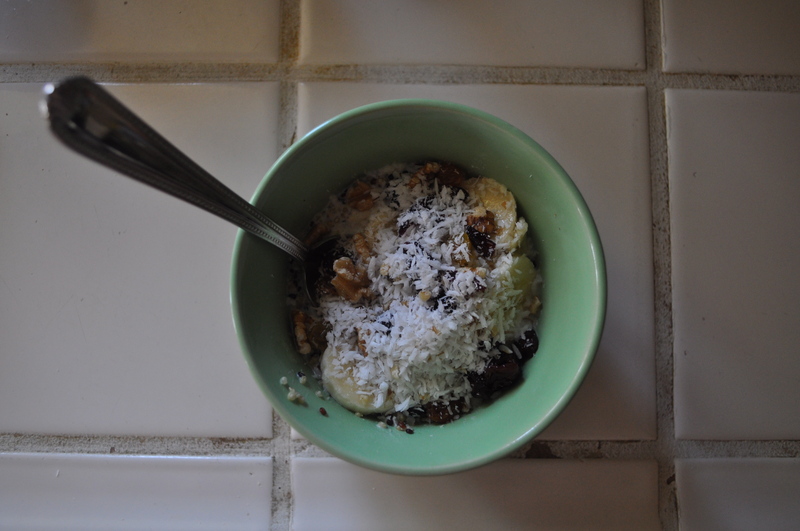 As you can see, I added banana, a little dried fruit medley, walnuts, coconut, and cinnamon, but you can really add anything you want. That’s it! You’re good to go. 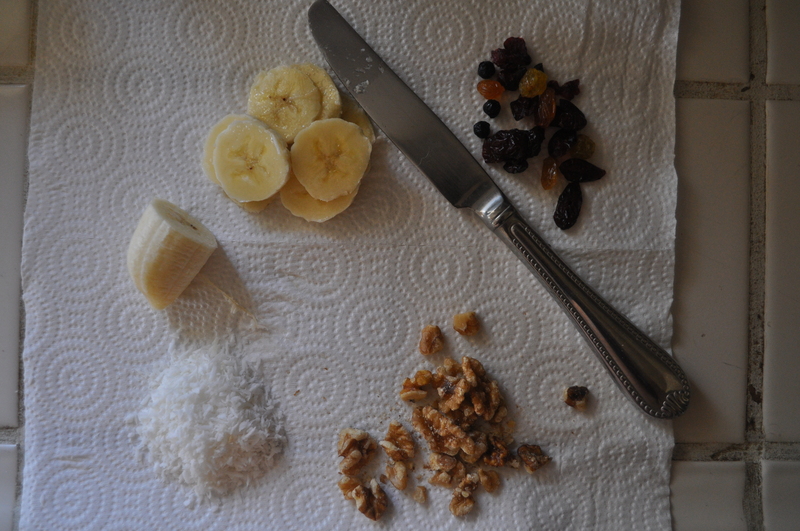 As for toppings, I’ve tried a bunch of different things; I find I don’t really need to sweeten it with anything other than the fruit, but some people like to add honey or agave nectar or something like that. I also love to add a splash of milk to my oatmeal, so I poured some on top of my quinoa as well. Fresh berries are also delicious; I’ve put in cut up raspberries and blackberries before and it was yummy. Pretty much anything you can put in oatmeal you can put in here. It’s pretty much the same thing, anyways. Basically all you need to do here is cook the quinoa, cool it, chop up all the ingredients, and mix ’em together! The olive oil, lime zest and lime juice are all for a dressing, so mix those, pour over the rest of the ingredients and toss. There ya go! Easy. The original recipe had a whole cup of cilantro, but since I’m not the hugest cilantro fan in the world I cut that down quite a bit. This should be served cold and is the perfect summer side salad. It’s crunchy and great. I did add a liiittle salt to my portion, I will admit, but otherwise the lime does the trick for adding some nice flavor to the dressing. Categories: Breakfast, Dinner, Snack | Tags: breakfast, dinner, quinoa, salad, side, snack | Permalink.